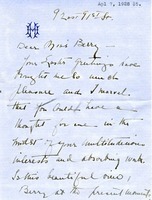 Berry's Easter greetings brought Hammond pleasure. 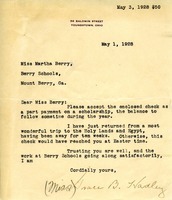 She sends greetings to Berry's sisters and niece, and encloses a check. 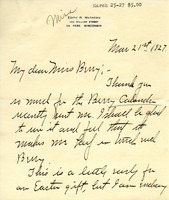 Berry thanks Achelis for Dr. Norwood's book, which she is enjoying and will pass on to the boys and girls when she is done. 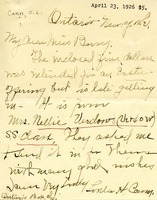 Berry is saddened by the death of Mrs. Marquand, remembers her visit to Achelis's home, and sends her regards to her maid, chauffeur, and other staff. 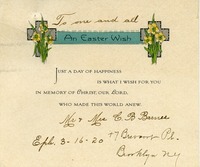 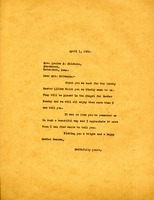 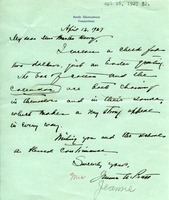 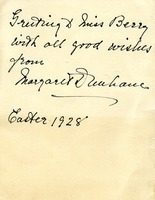 Card written on the first Easter after the death of Berry's mother. 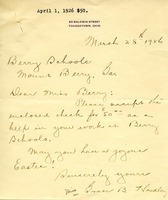 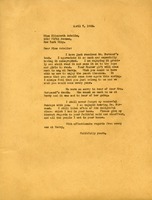 Letter with 2$ Easter donation. 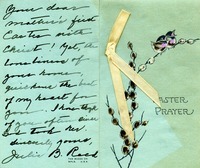 Sayles sends good wishes for Easter. 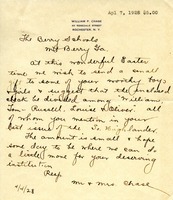 $50.00 donation from Grace B. Hadley to the Berry schools.